"Another amazing experience I've had as a Miami student was going to Thailand's Mahidol University in the summer of 2014…It was an unbelievable, life-changing opportunity to be a part of something so much bigger than myself." 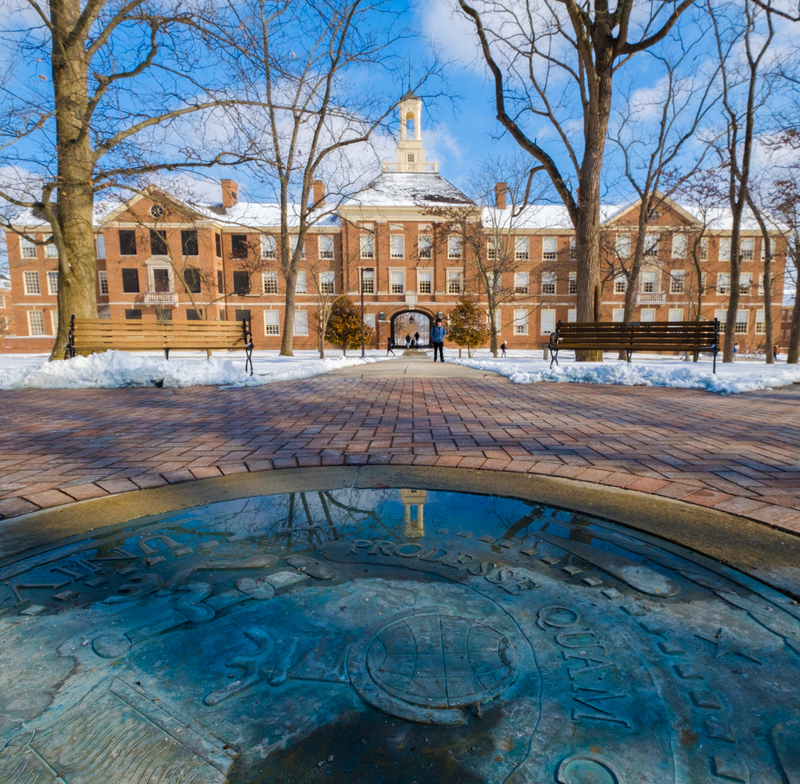 "The idea of college for me was like the front of a brochure: a student sitting in a grassy quad on a sunny day in front of red brick building, a professor standing in front of a chalkboard engaging with students, a group of students walking to class and laughing. This was Miami. "Miami perfectly fit my image of college being a place of academia, where the lines between students and teachers are blurred for the sake of learning and opportunity is everywhere. I love the fact that you can get involved in research or join an interesting club or even sit down with a professor during office hours. "I came from a very, very small high school with a graduating class of about 75 students, and that personalized experience was something I hadn't expected to get in college. The fact that Miami faculty and staff went out of their way for me and the experience I have had ever since that day have made my time here really special. "The thing that I like most about Miami is that it straddles the line between the past and the future. I think it has an incredible balance. This is a campus that is rooted in so much history and is something that I'm really proud to be a part of. I work as an admissions tour guide, and it's always exciting to be able to talk about all the incredible people who have gone through this school. Miami has a commitment to moving forward while also being rooted in the past. I love the idea that Miami knows exactly what kind of school it is, and it's reflected in the students, who are so proud to go here and know they're making an impact on the future of the campus." "I had a phenomenal experience working with Dr. Christopher Wolfe in his research lab on a project funded by the National Cancer Institute. Everything I've been learning in class is being directly applied to what I am doing. There have been so many different components to this research, allowing me the rare opportunity to integrate lab, clinical, and field work. "Joseph Palladino in the Department of Psychology is one of the most fantastic professors I've ever had. He creates a terrific atmosphere with engaging and interesting discussions and has a clear passion for what he teaches and for his students. 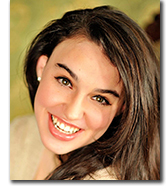 "Besides research and classes, I just love doing early morning runs through the picturesque campus or spending Sundays directing the children's choir at St. Mary's Church. I also spend the a lot of my day studying in King Library, often until very late at night. My friends and I all go down to the café and get hot chocolate for a study break. With everything being so busy, those little human moments are really special to me." "A liberal arts education is both broad and diverse, allowing you to take different classes and have different experiences that shape you into a more educated person who sees the world from a different perspective. You can be a chemistry major and take all chemistry classes and be perfect at chemistry, but you're never going to able to travel to another country or appreciate the art that's in a museum. I think it's really important to have those components. "I took an art history class, for example, and it was one of my favorite classes because it was so far out of the realm of what I'd been studying. It was enjoyable for me to get that new perspective. I love the opportunity to take those classes. I'm not the biggest fan of foreign language, but taking French classes here has forced me outside of my comfort zone and helped me to appreciate a culture at a different level. Even if we don't see it at the time, everything has an application. I may not use calculus and calculate derivatives on a daily basis in the future, but the logistic process of calculus is going to help me out to think differently. "Psychology is not a typical pre-med major if you don't want to be a psychiatrist or a clinical psychologist. For me, psychology is a way of understanding who the patient is and who you're dealing with. Having that humanistic approach really makes you a well-rounded physician, which is really why I'm interested in it. I feel that, even in my introductory classes, things that I have learned, such as being able to properly diagnose depression as a psychological cause and not a physiological cause, are really important distinctions. Psychology drove me because I want to go into oncology. Taking those psychology courses and understanding the effects, not just the disease, but all the emotional components that surround illness, are really important to learn." 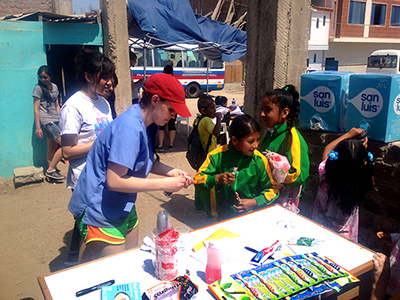 Cecelia Favede, participating in a medical brigade, interacts with Peruvian children. "In Spring 2014, I participated in a medical brigade in Peru, which was the very first time I had ever left the country. Peru really changed me. Before going I had such a preconceived, biased notion of the world. I'd assumed that going into an underserved population, everyone was going to look very sad and that it was going to be like some of the pictures you see, but the people were the happiest and most fulfilled, excited, kindest people I have ever met! They have practically nothing, and for me to look at my life and all the things that I have and they have no access to, it just shattered every perception I had. After I graduate from medical school, I want to work with organizations like Doctors Without Borders or MedLife to help populations that don't have access to health care and help create medical infrastructure. 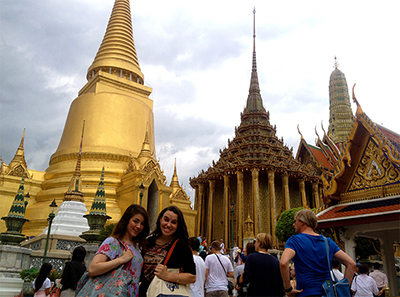 Cecelia Favede and a friend pose in front of temples in Bangkok, Thailand. "Another amazing experience I've had as a Miami student was going to Thailand's Mahidol University in the summer of 2014 through a program with the University of Oxford in the UK. Looking back, this was one of the craziest things I have ever done. I got on a plane and went over during the middle of a military coup, with no reservations! But I had no fear going in. I was part of a unit called the Mahidol-Oxford research unit, which deals with eradicating malaria and creating a self-sustaining healthcare system for the future. I also worked with the Bill and Melinda Gates Foundation, which donated money to the research unit. We looked at the sustainability of the program and how they could improve it in the future. It was an unbelievable, life-changing opportunity to be a part of something so much bigger than myself. "Peru made me respect the world a little bit more, but I think that being able to live in Thailand by myself, not speaking any Thai, and participating in such meaningful work all gave me a surer sense of who I am and what I am able to achieve." "I would say the most important thing is to find something that you love and pursue it. Having a passion about something makes such a difference. A lot of students typically major in what they think is expected of them, something they think is going to determine their future career. But I think that if you're not enjoying what you're doing, then the rest of your life is not going to be gratifying. If you want to go into finance or business, but you have a passion for architecture, take the architecture courses too! After all, you may end up changing what you want to do with the rest of your life. "Finding what you love makes your life so much more fulfilling. Going and being able to do that everyday is so much more of a reward than doing what you think is expected of you. College is a phenomenal time to find that passion, so don't let the opportunity get away from you."